In order to work lawfully in Russia, a foreign national has to obtain a Russian visa. The issuance of a work visa is the most complicated issuance of all. 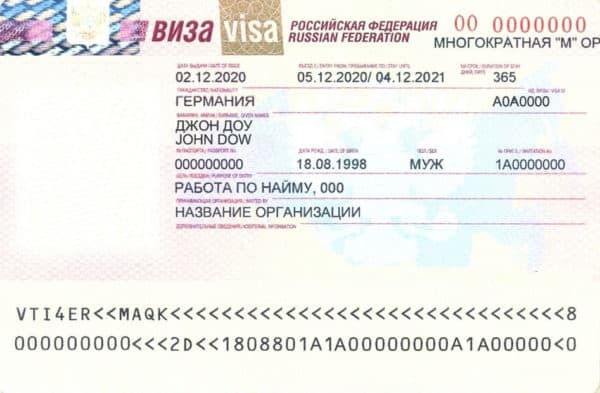 The material below informs you how to issue a Russian work visa for foreign nationals. What is a work visa? Work visa not only confirms that a foreigner stays in Russia legally but also gives him/her an opportunity to work in Russia for the whole period of a visa validity. The issuance of this document is connected directly with the issuance of the invitation as well as with the rule of the quota for external specialists. Pay attention! A Russian work visa gives you the right to work only in the company that has issued the invitation. The violation of this rule may lead to the cancellation of the visa. In order to get a work visa, a foreign national has to have an invitation from the employer registered in Russia. The ability to issue an invitation depends on the quota for external specialists approved annually for every constituent entity of the Russian Federation. After getting the invitation, a foreign national has to apply for a visa to a consulate of the RF in the country where he lives. Work visa for foreigners is issued for a period up to one year. Pay attention! In order to prolong a visa, you should go through the procedure again, which means to leave Russia, arrange a new invitation and apply for a visa in the normal way. The duration of the issuance can count from 7 to 14 days, and the size of a consular fee depends on the country where you apply for a visa. In order to clarify specifics of the document issuance, apply to our specialists. With our help, the issuance won’t be a problem, and your visa will be issued as soon as possible. In order to refine the features of filling in the application for a work visa, consult with our specialists. We can resolve any problem with the issuance of the invitation and the visa itself. How much does the issuance cost? The size of a consular fee depends on the country. You can clarify all the details on our web or during the consultation with our specialists. We offer the full set of services or visa issuance for a foreigner invited to work in Russia. How can a foreigner obtain a visa? It requires particular actions not only from a foreigner but also from his Russian employer. The issuance of a work visa to Russia won’t be a problem if you use our company’s services. We have a crew of experienced specialists ready to resolve any issue as quickly as possible.